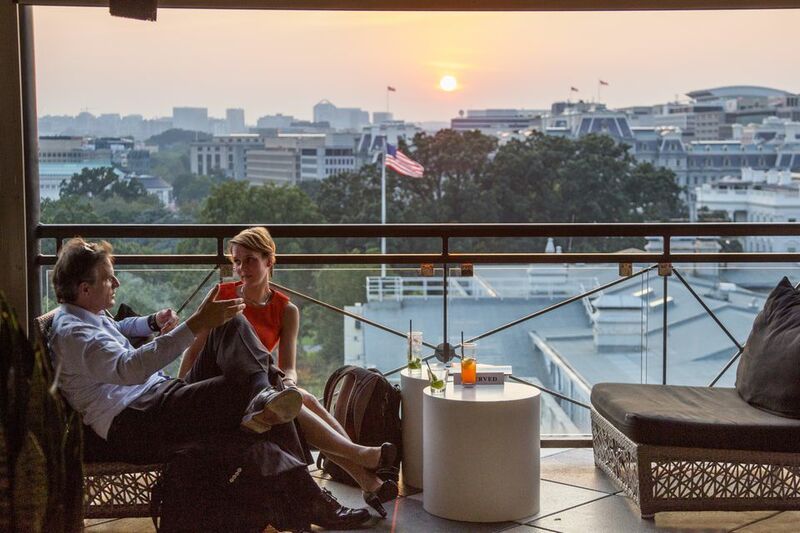 10 Great Hotel Bars and Lounges in Washington, D.C.
Washington, D.C. has a number of hotels that feature elegant bars and lounges that offer a wide array of spirits and are nice places to unwind before or after dinner. Following is a guide to some of the best hotel bars in Washington, D.C. Learn what makes each destination a "hot spot" in the nation's capital. The Hay-Adams is a historic hotel that is located near the White House. It features a cozy bar and lounge called Off the Record, which is popular with locals and visitors and serves classic cocktails and upscale bar food. It's a prime spot for relaxing with its red leather booths and walls aligned with caricatures of Washington's politicians. Bar Rouge at the Kimpton Rouge Hotel is an ultra-modern lounge near Dupont Circle that serves breakfast, dinner, and late-night cocktails. This is a popular spot for happy hour with drink and appetizer specials available for several hours every Monday through Friday. The menu features items such as cornmeal crusted calamari, Bayou shrimp toast, bacon burger, and salmon salad. Located near Dupont Circle, the historic Tabard Inn features a cozy bar and lounge with antique furnishings and a wood-burning fireplace. Jazz is offered on Sunday, Monday, and Tuesday nights with first-come and first-served seating. The menu features classic cocktails and a world-class wine list. EDGAR is an upscale American restaurant with an elegant bar that offers creative twists on classic drinks, specially-selected wines, local craft beers, and more. With its location near K Street, the restaurant and bar are power dining spots in the heart of Washington, D.C. The Dirty Habit is a modern restaurant and bar located in the Penn Quarter neighborhood near Capital One Arena. The bar, found at Hotel Monaco, is a popular gathering spot with a glassed-in atrium lounge and an outdoor courtyard. The restaurant and bar provide an atmosphere that focuses on social interaction with bar-centric food equally suited for happy hours, sit-down dinners, and late-night bites. The menu features globally influenced seasonal cuisines such as duck and foie gras meatballs, tempura calamari, and guinea hen dumplings, which was inspired by an Eom family recipe. Point of View (POV), which is the rooftop bar and terrace at the W Hotel, is one of the area’s most popular destinations with its unsurpassed views of the nation’s capital. The bar overlooks the White House and the National Mall. The menu includes a wide array of spirits and a light fare menu. Drinks are pricey, but it is a great spot to wow your visiting friends or relatives. Located just off the lobby of the historic Willard InterContinental, the Round Robin & Scotch Bar is a legendary bar that has been a lively meeting place for Washington, D.C.’s political and social elite since the days of Abraham Lincoln. The bar has a sophisticated atmosphere and serves classic cocktails. It is a good spot for people watching. The Quill is an upscale bar at The Jefferson that is decorated with sketches of former presidents and a collection of 18th-century maps. The bar menu includes a mix of classic and signature cocktails and a dynamic wine list. The Alex is an intimate and approachable lounge and dining space nestled within The Graham Georgetown. The Alex name is drawn from Alexander Graham Bell which, like the hotel, pays homage to the life and times of the scientist, inventor, and innovator. The intimate cocktail lounge features a cozy, modern twist on the early 20th-century "Steam-Punk" aesthetic. The menu offers craft cocktails, fine spirit concoctions, and fine wines. Located in Georgetown, ​Bourbon Steak is a contemporary steak restaurant that offers a casual bar with luxurious details including stained white oak flooring as well as leather-topped tables and ceilings, with a view of the garden and courtyard. The restaurant serves contemporary American fare with a focus on seasonal ingredients.